San Onofre Nuclear Generating Station is currently upgrading part of their security by adding several concrete and steel reinforced ballistics walls to their security perimeter. 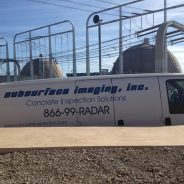 To accomplish the utility locating duties our company has been hired to perform. Our technician is using a 400 MHz ground penetrating radar antenna, as well as passive and field induced locating devices. Phase I of our project: Locate and map out all utilities within a trench line that is approximately 10 feet wide by 4500 feet in length to a depth of 4 feet. Phase II: Locate and map out all utilities within a trench line that is approximately 40 feet wide by 1 mile in length to a depth of 4 feet.